The sun starts to cast long shadows on the ground and this is a sign that the plant-loving months are almost over. It is also a sign that preparation for the next months into next year must begin. 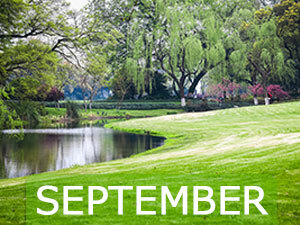 Follow these tips for a spectacular September. – KEEP IT UP: Although Autumn is on its way, spare a thought for the fact that your hanging baskets will continue to live until it begins really frosting over. So don’t neglect them: dead-head and feed them! – AUTUMN FLOWERS: To keep the appeal of your garden fresh and flourishing, purchase some autumn flowering plants such as pansies, violas and geraniums which come in a beautiful variety of colours. – PLANT NOW: For a blooming Spring, plant daffodil bulbs now.